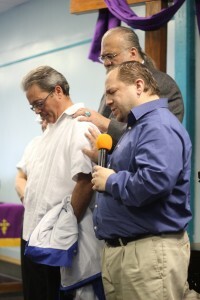 On Tuesday, April 5, 2011 a delegation of religious leaders from across the Chicago area gathered at “Mi Panama,” restaurant for a lunch meeting sponsored by La Capilla del Barrio / The Neighborhood Chapel in honor of former Puerto Rican Political Prisoner Carlos Alberto Torres. “The food was good, but the purpose of our gathering was even better,” said La Capilla del Barrio’s Pastor, Dr. Pedro J. Windsor. Carlos shared some personal history regarding his struggle and that of Oscar López Rivera. Jan Susler, Oscar’s attorney provided some excellent background regarding the developments of how Oscar’s probation hearing was “ambushed,” and in her legal opinion wasn’t given a just hearing. The clergy in attendance representing various denominations spoke with one voice agreeing to 1. Provide Consistent Pastoral Care and Visitation to Oscar. Lopez Rivera. 2. Organizing an ecumenical service on May 29, 2011 at the Lincoln United Methodist Church, 2242 S. Admen Avenue, Chicago, IL. 3. Raise awareness within our churches, mosques, and temples regarding the plight of Oscar’s quest for freedom. 4. Sponsor a tour in October 2011, so that Carlos Alberto Torres can speak at various temples, churches, mosques, community forums and schools. Historically, the religious community in Chicago and across the globe has been engaged in the struggle to free all the Puerto Rican Political Prisoners. “Like with so many we too look forward to the release of the last Puerto Rican Political Prisoner, our brother Oscar.” said Windsor. Next Post: Triumphant Return of Carlos Alberto Torres!